W&L Kicks Off 2017 Musical Season with Fall Choral Concert Joining the Washington and Lee University Singers are the women's choir, Cantatrici, and the Men’s Glee Club. Washington and Lee University kicks off its 2017 musical season with three singing groups as they perform at the Fall Choral Concert on Tuesday, Oct. 24 at 8 p.m. in Wilson Concert Hall. 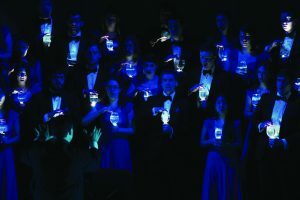 Joining the Washington and Lee University Singers are Cantatrici (women’s choir), and the Men’s Glee Club, a Lexington tradition since the 19th century, all under the direction of Shane M. Lynch, associate professor of music and director of choral activities. Tickets are free, but required. There’s a Meetin’ Here Tonight,” a fun and energetic opener. The women of Cantatrici will immediately follow with Joni Jensen’s evocative “El Vito,” featuring senior Kathryn Huntley as the soprano soloist. Additional works include audience favorites like Biebl’s “Ave Maria” and Burchard’s “Ecce dedi verba mea,” but the highlight will be Brahms’ “Rhapsodie Op. 53” featuring senior Dana Gary as the soloist. The University Singers will then take the stage, opening with the final movement of Bach’s classic motet “Singet dem Herrn as well as “Elegy for the Fallen”— Ešenvalds’ aforementioned work and Dan Forrest’s sublime “Abide.” The performances will use lighting and movement to paint the aural and visual picture of the horrors of the battlefield and the call for forgiveness and reconciliation. The performance will be streamed live online at https://livestream.com/wlu/events/7685671.